I’ve got to say, I am having THE BEST time experimenting in the kitchen as a newly omnivorous cook! I keep bookmarking all sorts of recipes, and every so often one gets really stuck in my head. These Turkey Meatballs from Bon Appétit totally got me fixating. I loved the idea of warm and homey tomato sauce, and being able to have it as a main meal with a healthy and hearty protein. This is the tomato sauce I use for just about everything — lasagna, pasta dishes, and pizza sauce! And now it’s great for turkey meatballs too! Instead of going with the spinach, I used beet greens, as they came with a bunch of beets in my veggie box, and were too gorgeous not to use up! But you could also use a package of frozen spinach (10 oz) or a clamshell of baby spinach here. Mr. KitchenOperas and I enjoyed these 2 at a time, swimming in a bowl of sauce. We loved the anise flavour from the fennel seeds to complement the ground turkey — I wouldn’t make them any other way! 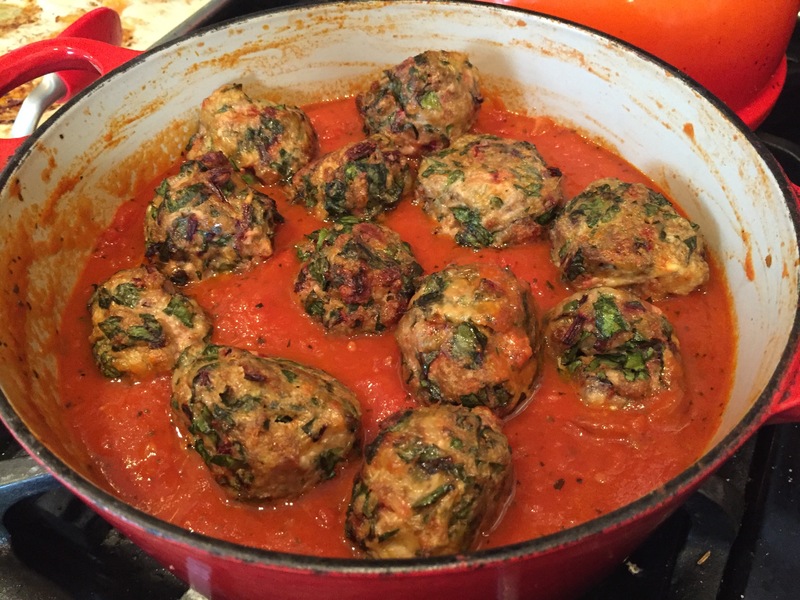 Inspired by Bon Appétit’s Turkey-Spinach Meatballs, Serves 4. In a large, heavy-bottomed pot, sweat the onions over low heat until they are translucent. Add the oregano, basil, paprika, sea salt, and diced tomatoes, and bring to a boil over medium heat. Turn the heat down to low, and simmer the sauce for 30-45 minutes. Add the butter, and stir. While the sauce is simmering away, mix together all of the ingredients for the Turkey Meatballs (except the olive oil) in a large bowl. Scoop out the turkey mixture by the 1/4 cup, and form into balls with your hands (I got 12 balls). Place the balls onto a parchment-line baking sheet, and brush with the olive oil. Broil the meatballs, turning every 5 minutes, until browned all over and cooked through (ground turkey is safe at 165°F), about 15-18 minutes. Add the turkey meatballs to the marinara sauce and serve hot!